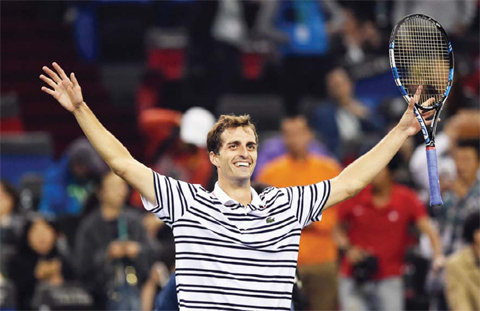 SHANGHAI: Seventeen-time Grand Slam champion Roger Federer crashed out to little-known Spanish left-hander Albert Ramos-Vinolas in a major shock in his opening match at the Shanghai Masters yesterday. Defending titleholder Federer was stunned 7-6 (7/4), 2-6, 6-3 by the world number 70, who is yet to claim his first career title and has only won three matches in total at the Grand Slam tournaments. Federer, 34, gave a thin smile and a wave to the crowd, which included his idol Rod Laver, as he left a shocked Qi Zhong Stadium, where he lifted the trophy last year and won the 2006 and 2007 Tennis Masters Cup. “I just think the first round here in Shanghai has always been historically quite difficult, getting used to the conditions and the surface and the balls,” said Federer, who saved five match points against Leonardo Mayer in his opening match last year. “The balls play very different than in other places. Last year I got lucky. This year I didn’t. So it’s a pity.” Ramos- Vinolas is the lowest-ranked competitor to beat the world number three in more than two years, since he lost to Argentina’s 114th-listed Federico Delbonis in the Hamburg semi-finals in July 2013. Federer, who had a bye in the first round, had played Ramos- Vinolas only once before, in the first round of Wimbledon in 2012, dropping just three games in a 6-1, 6-1, 6-1 dismissal of the Spaniard. “Before the match I thought I’m not going to win. But when I saw how I was playing, it was not the same as Wimbledon,” said the Spaniard. “It was my first Wimbledon. I didn’t feel comfortable during the match. “But here, when I saw that we were very, very similar during the first set, I thought, ‘Okay, maybe I can do a good match.’ And it was a very different story in the Shanghai second round on Tuesday as Federer struggled to impose himself in the first set and collapsed in the tie-breaker with a string of unforced errors. Order was seemingly restored as the great Swiss broke early in the second set and again for 5-2, before calmly serving it out to level the match. But disaster struck as Federer served at 2-3 down in the third, when he dished up a double break point and then clipped the net before Ramos- Vinolas punched away a forehand for his first break of the night. And Federer caused his own downfall in the final game as he netted a forehand to bring up match point, and then misfired a backhand return to leave a disbelieving Ramos-Vinolas saluting the crowd. “I played him at Wimbledon before, so I knew him. I’ve seen him play. He’s definitely improved since then. That was a while back and that was not his favorite surface,” Federer told reporters. “I was aware that he could give me a tough workout and even beat me. I’m always cautious. I don’t underestimate or lack respect for anybody out there. These guys are all touring professionals, they know what they’re doing. “The margins are so small, that’s why I sometimes struggle to talk to you guys about, ‘Yeah, I’d like to play Novak (Djokovic) in the finals, Rafa (Nadal) in the semis, (Jo-Wilfried) Tsonga in the second round.’ “It’s not like that. Now you’re not asking me those questions. I wonder why, you know. Because I’m on a flight.” Meanwhile, Novak Djokovic yesterday said the Rio Olympics would be one of his top priorities next year as he looks to add a gold medal to his haul of Grand Slam titles. Top-ranked Djokovic, a 10-time Grand Slam-winner, said he had already started planning his schedule for next season with the Rio de Janeiro Games marked out as a major target. He added that he was considering skipping the second round of the Davis Cup, which falls between Wimbledon and the Olympics. Djokovic won Olympic bronze at Beijing 2008.